Peugeot’s versatile seven-seater 807, the first MPV to score 5 Stars in Euro NCAP, now benefits from a more powerful 2.0-litre 120 bhp turbo-diesel power unit, that replaces the existing 110 model. With a maximum torque output of 225 lb ft driven through a six-speed manual gearbox, performance is improved with acceleration to 62 mph in 12.9 seconds and onto a potential 111 mph maximum speed. Euro 4 compliant, the new engine achieves a combined drive cycle economy of 40.9 mpg and 48.7 mpg on the Extra Urban cycle, with 182 g/km recorded for CO2. The HDi 120 can be specified in all three trim levels – S, SE and Executive. The SE and Executive specification now features as standard a new RD4 CD player with MP3 playback capability and S models are now equipped with 16" Antheor wheels. 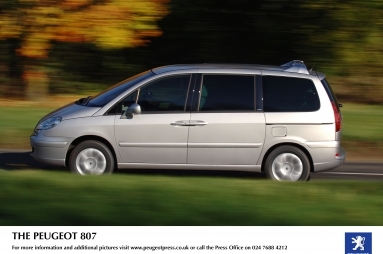 The Peugeot 807 is a 5-door, 7-seater MPV manufactured in Valenciennes, France. The engine range includes a 2.0-litre petrol and 2.0- & 2.2-litre HDi turbo-diesels and is available in S, SE and Executive trim. UK price range: £19,535 (S 2.0) – £24,995 (Executive 2.2 HDi Automatic). 110,000 807s have been produced (to Dec 2005) with 7,400 sold in the UK. Key features include: seven-seats (no-cost option bench seat totals eight), ESP standard, practical and versatile features, including 53 storage spaces, sliding rear doors (on SE & Executive models) and six airbags – as the first MPV awarded 5 Stars in the Euro NCAP tests.